Wayne has been fascinated by fiddlers and fiddling since he was a young boy of 3. When he had the opportunity to begin learning violin in the public schools a few years later he jumped at it. He studied privately and participated in school orchestras, but his real love was for the fiddle. 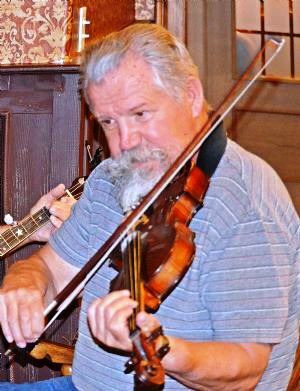 He searched out tunes and fiddlers every chance he got, and in the process developed his own style of playing, that is very similar to the Illinois (Midwestern) Old Time style resurrected and exemplified by Garry Harrison and “Chirps” Smith. He has a fascination with the changing names and structure of tunes from all regional styles of Old-Time Music. Wayne spent several years in the Tucson, Arizona area, and has played in jams and dances throughout the Southwest. He has a special interest in the fiddle music of the T’oh’ono O’dum (Papago/Pima) people of southern Arizona. Wayne jams with whoever he can whenever he can; he believes that the real joy of fiddle music is sharing it with like-minded musicians. He loves to play for dancers, and plays whenever he can for the local C/U Country Dancers, and any other similar dances that come along. He is a regular at festivals like “Battleground” in Indiana and “Cliff Top” in West Virginia.